Home | Blog | Q&A with Jennifer Kline: Why was my workers’ compensation claim denied? Workers’ compensation insurance is in place so that employees can receive medical treatment and lost wages when they are injured on the job. Unfortunately, the workers’ compensation insurance company may deny your claim for a number of reasons. Jennifer Kline, one of our certified workers’ compensation specialists, talks about common reasons why a claim may be denied and gives advice on what to do if your claim is denied. Is there a deadline for me to report my injury? Yes. In Pennsylvania, in order to receive compensation, you must notify your employer within 120 days of the date of injury or of the date you became aware your condition is work related. If you don’t notify your employer within 120 days, your claim will likely be denied. Even though you have 120 days to report the injury, you should notify your employer in writing of your work-related injury or illness as soon as possible. If the injury happens on a Friday, do not wait until Monday to report the injury. The longer you wait to report your injury, the more difficult it will be to prove that your injury is related to your job. This could result in your claim being denied. If you get hurt at work, report it immediately to a supervisor and complete an accident report. May I choose my own medical provider for a workers’ compensation claim? In Pennsylvania, most employers have a designated provider list. Typically, as long as certain requirements are met, you must treat with one of the listed providers for the first 90 days of treatment. When seeing the medical provider, make sure to tell them about the work injury. Failure to tell all the doctors you see about the work injury could result in your claim being denied. Can my pre-existing injury be the reason why my claim was denied? A pre-existing injury does not disqualify you from receiving workers’ compensation benefits. In fact, an aggravation of a pre-existing condition is considered a work injury. However, often the insurance company will deny your claim if you had a pre-existing injury to the same body part that was injured in your workplace accident. For example, if you suffered an injury to your low back outside work and then suffered a low back injury at work, the insurance company may deny your claim, arguing that your low back problems are not work related. I was injured before I clocked in and my workers’ compensation claim was denied. Why? 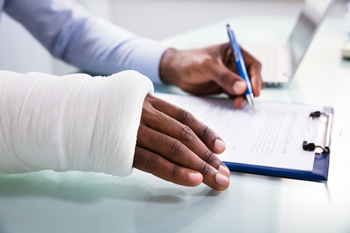 Claims are commonly denied if the insurance company believes that you were not in the course and scope of your employment at the time of the injury. Injuries before you clock in, after you clock out or while traveling to a different job site often are denied by the insurance company. Many of these injuries however should be covered by workers’ compensation and if you receive a denial, you should consult with an attorney. If your workers’ compensation claim is denied, you have the right to appeal the decision and file a Claim Petition. An administrative law judge will be assigned to your case and hearings will be held. The insurance company will have a lawyer representing its interests. During this process, which can take nine to 12 months, evidence from both sides will be presented and the judge will then make a decision in your case. The workers’ compensation system is complex. At KBG, we welcome your call about any questions you have. It’s typically better to involve a lawyer early in the process, even if you are not sure you are ready to hire an attorney. If your claim has been denied or you want to learn more, contact our attorneys at KBG Injury Law. We’ll help you get the Results You Deserve®.